For most of the 20th century, gardens were a formal place . Borders were immaculate, and lawns were doused with chemicals to keep them free from the merest hint of a daisy. As for children, they were tolerated but not encouraged. Just as you got told off if you made a mess in the living room, you weren’t supposed to dig for worms, pick flowers or swing from branches. Fast forward to the 21st century and it’s all rather different. The generation that was first exposed to the idea of the garden as an ‘outdoor room’ in the 1970s now has children and grandchildren of its own. Today’s parents and grandparents don’t want the garden to be a child-free zone, any more than they want to grow stiff rows of dahlias to enter at the local flower show. Today, the garden is increasingly seen as a place for all ages, a space where the adults can sit and relax while the youngest members play energetically but safely. 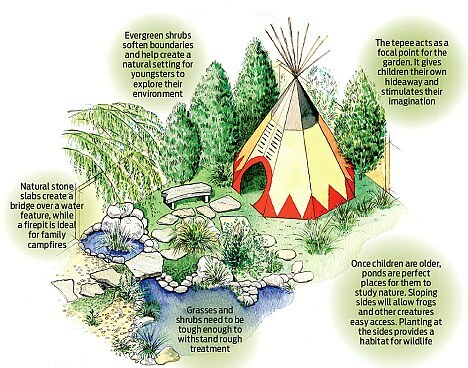 Yet creating a garden that appeals to all age groups is surprisingly hard. All too often, a ‘child-friendly’ garden is dominated by a huge trampoline, while the lawn has been worn into submission by too many ball games. So does this mean that the adults should simply resign themselves to the garden being one big play area? Not a bit of it, says Chris Young, passionate gardener and editor-in-chief of the RHS’s Encyclopedia Of Garden Design, which features a number of stylish family gardens and several sections on making play areas and tree-top retreats. Chris is father to Jacob, five, and Isabella, three, and a firm believer in getting his children as involved in gardening as possible, so that the garden becomes an educational tool as well as a place of fun. Chris has worked out some cunning techniques to lure his children outside on days when the telly seems more attractive than the garden. ‘I give them “important” jobs that “only” they can do, like helping sweep a path with a dust pan and brush, digging a planting hole, or top-dressing containers with gravel or wood chip,’ he says. So how do you go about planning a family garden? In large gardens, different areas can be carved out to accommodate everyone’s needs, but in smaller gardens the layout needs to be more creative. There are a few key elements to bear in mind before you tackle your design. Play equipment – is there room for a permanent slide or swing? If not, use equipment that can be cleared away. Colour – a family garden needs plenty of bright primary colours. 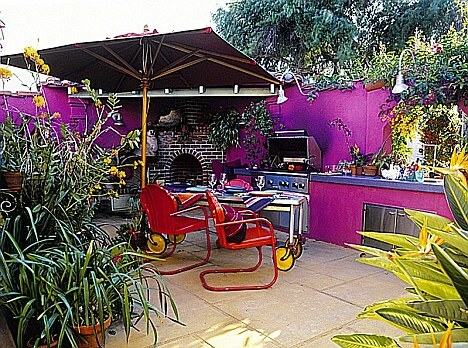 You can introduce colour by painting walls, trelliswork and furniture, and through imaginative planting. Planting – is it easy to maintain and resilient enough to withstand footballs, pets and swordfights? Wildlife features – children will adore messing about by a pond and spotting insects. Birdfeeders will also be a big success. Easy-care seating – furniture that can be left uncovered is best. That doesn’t necessarily mean plastic: synthetic rattan, wood and lightweight metal are all good, durable options. Since children’s tastes change rapidly, you need to be adaptable. Once something has fallen out of favour, be unsentimental and find a good home for it. This means your design needs to be flexible. A play area near the house is ideal for small children, but older children will want something well away from the eagle eye of parents. The garden is the ideal place to allow children to take some risks – a familiar yet ever-changing environment where they can get muddy and explore the natural world. Plants have to be robust enough to withstand rough treatment from children and pets, so avoid fragile blooms. With young children around, you should steer clear of plants with thorns. It’s well known that foxgloves and deadly nightshade are poisonous, but other seemingly innocuous things, such as uncooked rhubarb leaves and daffodil leaves and bulbs, can also be poisonous. Train your children never to put leaves or flowers in their mouths. Great plants for a family garden are Choisya ternata (Mexican orange blossom) – tough and reliable, with very fragrant flowers; buddleia – robust and attractive to butterflies; Stachys lanata (lamb’s ears) – children love the soft feel of its grey leaves; lavandula (lavender); chocolatey-smelling Cosmos atrosanguineus (chocolate cosmos); and Rosa ‘Zéphirine Drouhin’, a strongly scented, repeat-flowering bright pink rose that is completely thornless. It’s also a good idea to set aside an area for children to grow their own plants. They could try growing easy vegetables, such as beans and lettuces, which they can pick and eat, or annuals such as sunflowers and nasturtiums. Dogs love to dig and run around in gardens, so try to give them an overgrown area where they can forage, while teaching them to leave the flowerbeds alone. Cats will use freshly dug soil as a litter tray, so keep it covered with fleece, a cloche or an array of twiggy sticks. Ponds attract a wealth of animals, birds and insects, and children love paddling, collecting tadpoles and identifying insects. But small children can drown in a few inches of water, so it’s prudent to wait until they’re older before installing a water feature. On a summer’s evening, there are few nicer activities than an alfresco family meal. Any patio should be large enough to accommodate a dining table and chairs. If you’re lucky, there will also be enough space for a barbecue.